This Self Service Photo Reprint EULA is included in editable Word format that can be customized in Word or by using the included Wizard software. THIS END USER LICENSE AGREEMENT (EULA) is made this Current Day day of Current Month, Current Year by and between Company Name ("Licensee") doing business as Website URL and Company Name ("Customer"). "Self Service Print" - Do-it-Yourself printing where Customer purchases a license for a digital file to be downloaded by Customer and printed by Customer. Printing is done by Customer at Customer's expense. "Content" - Stock photography ("images") provided to Customer by Licensee in the form of a digital file. "Content Metadata" - Information attached to Content, including camera information, locations, creation dates, captions and keywords. "Customer" - The individual person or company who paid licensee fees for Content. Provide a digital file for downloading by Customer of the purchased Content. Grant of license to use Content as outlined in this Agreement for which license fee has been paid in full by Customer. Due to differences in height and width proportions of the original image, photo reprints may not always fit an exact print dimension (i.e. 8x10, 11x14, 16x20). Customer agrees that at least one dimension may differ by one or two inches. Colors will not match exactly what Customer originally viewed on the Company's web site. Due to differences in each Customer's monitor colors and inks used in different printers, it is impossible to maintain color profiles between Customer's computer monitors and service provider's printers. Prints are to be made by the Customer from the downloaded Content. Customer receives no digital access rights to Content for any other use. Customer is granted ownership of the physical print purchased for non-commercial use. Customer may not duplicate or redistribute the Content by any means (physically or digitally) other than for personal use. Customer may not use the Content for any commercial, editorial, or other purpose for which stock photography is typically used. Customer may use the Content only for personal use as decor. Display of Content in a single location can be in public view, in a private or commercial location. There are no returns or exchanges on digital files. Licensee does not make any representations for the rights to use any individual's name, likeness, or image in any Content or Content Metadata. Customer agrees to indemnify and hold Licensee harmless from any and all claims brought by any third party relating to any aspect of the Services, creative or other content, including, but without limitation, any claims resulting from any demands, liabilities, losses, costs, and claims, including attorney's fees. 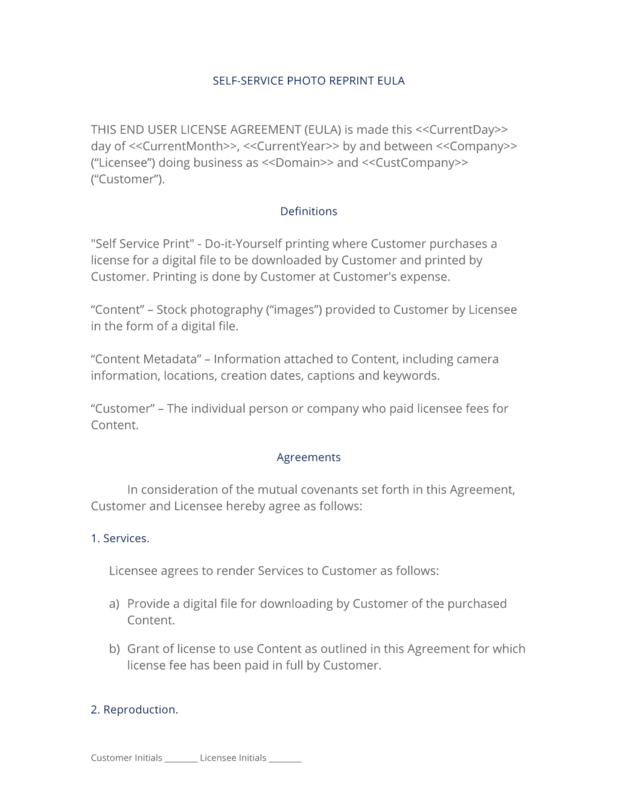 The complete Self Service Photo Reprint EULA - with the actual formatting and layout - is available in this Contract Pack.